JANUARY 29, 2015: Tax documents for retired Massachusetts public employees are now in the process of being issued by the 10 retirement systems. The IRS gives retirement boards (and all employers) through January 30th to issue 1099s to those retirees and surviving spouses who received a retirement allowance in 2014. Some systems have already mailed the forms to retirees. All members should receive their 1099 document by the end of the first week of February. The Association will be holding its annual winter membership meetings in January and February. Association members are encouraged to attend and welcome to bring a guest. Please note, all Association meetings now begin at 11:00am unless otherwise noted. NOVEMBER 21, 2014: At its monthly meeting, the state’s Group Insurance Commission discussed a growing concern for the health plan administrators, as well as our Association – a growing multimillion dollar budget shortfall, combined with a downturn in state tax collections. OCTOBER 24, 2014: Earlier this month the Association mailed a six-part questionnaire to all five Massachusetts gubernatorial candidates. The goal was to learn the candidates’ views toward public retirees, defined benefit pension plans and retiree health insurance benefits. Boston – The 62,000 member strong Retired State, County and Municipal Employees Association “Mass Retirees” has endorsed Maura Healey for Attorney General. The Association cites Healey’s public service background and, specifically, her work on health care issues as the reason for the endorsement. The Massachusetts state treasurer could stay busy with the basic responsibilities of managing the state’s cash flow and debt. But the holder of the office has a much broader portfolio, overseeing the state school building fund, lottery, alcoholic beverages commission, public pension fund, state retirement board, and other duties. The position demands an executive with high energy and wide-ranging experience. That candidate is Democrat Deb Goldberg. A Herald editorial cites a recent report by the Massachusetts Taxpayers Foundation on health insurance coverage for retired public employees (“The retiree dilemma,” Sept. 27). Like similar reports filed by the MTF in recent years, this report we believe is flawed and biased toward an ideological position, to cut retiree benefits. In addition to cherry-picking its data to paint the most dire results, the MTF fails to account for reforms passed in 2009 and 2011. Communities opting into the new laws have collectively saved nearly $250 million in their first year. Among those items of unfinished business the Patrick administration — and this sitting of the Legislature — leave behind is any attempt to reform the health care benefits paid to retired municipal workers that are bankrupting the state’s poorest communities. STATE HOUSE, BOSTON, SEPT. 22, 2014…..Retiree health care costs are sapping more and more money each year from cities that are ill prepared to weather new fiscal burdens, according to a new report from the Massachusetts Taxpayers Foundation. The dynamic of retiree health care costs growing faster than property tax revenues exists throughout Bay State cities and towns, according MTF President Michael Widmer, who said cities where lower incomes predominate have fewer resources to succeed under those conditions. 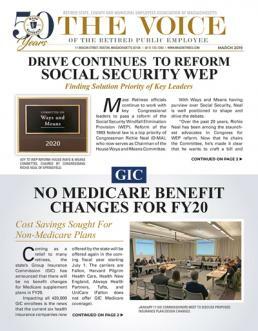 SEPTEMBER 12, 2014: This week Association officials traveled to Washington, D.C. for a series of meetings on the issue of the Social Security Windfall Elimination Provision – AKA the “WEP” law. SEPTEMBER 10, 2014: Association members turned out in droves in support of our endorsed candidates on primary Election Day. On a day when overall turnout amongst the general voting public was very low, retirees helped propel Deb Goldberg and Steve Kerrigan to victory in the Democratic primary for State Treasurer and Lt. Governor, respectively. Goldberg now faces Republican Michael Heffernan in the General Election November 4th. Deb Goldberg for State Treasurer - "Court"
On Tuesday, August 19th at 11:00am we will be hosting a complimentary continental brunch at the Radisson Hotel Plymouth Harbor, Located at 180 Water Street, Plymouth. Frank Valeri, our Association’s new President will chair the event. Frank has greatly energized our Association since assuming office and is looking forward to sharing his innovative goals with you as a member. U.S. state and local-government pension investments gained the most in three years as stocks soared, according to a report to be released today by Wilshire Associates Inc.
July 15, 2014: With a growing number of members now using the internet, the Association is expanding our online services. 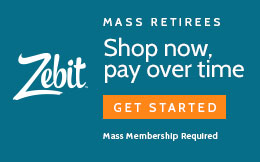 In addition to our website (www.massretirees.com), we are now emailing electronic updates and breaking news alerts to those members using email. We also place weekly updates and other unique features on our website, that are in addition to our award winning newsletter and toll-free hotline. And for those members seeking electronic payment options, we offer dues renewal through our website.